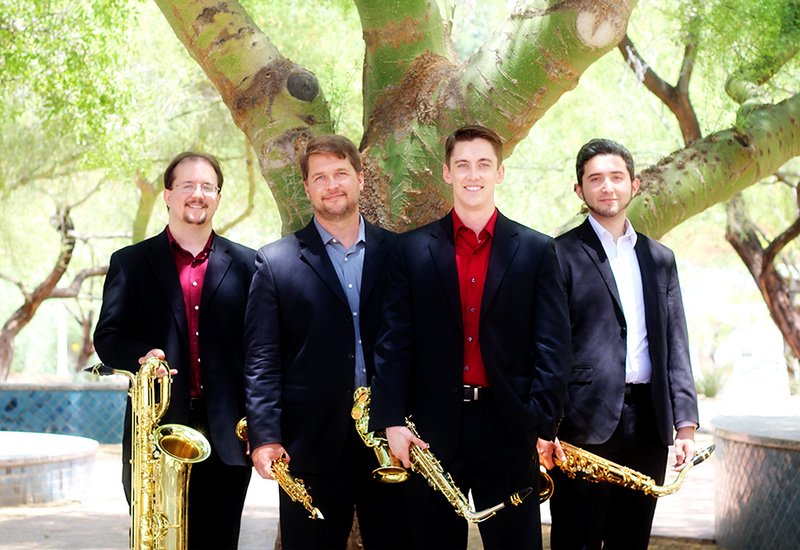 The Presidio Saxophone Quartet give the US premiere of 'The Shannon Suite' for sax quartet. The Presidio Saxophone Quartet gave the US premiere of, 'The Shannon Suite', for sax quartet in Bisbee, Arizona last night as part of the, 'For the Love of Music Concert Seiries'. The Presidio Saxophone Quartet plays with a level of refinement that characterizes the very best chamber ensembles. This seasoned quartet performs with technical fluency, rhythmic exactitude, elegant phrasing, and a broad dynamic palette. The result is an unforgettable musical experience. Hailing from the beautiful Sonoran Desert surrounding Tucson, Arizona, the Presidio Quartet has delighted international audiences with their “wonderful banter and provocative performances” since 1998. “Their blend, intonation, and musical sensitivity are really world class” (Tucson Citizen) and they possess a “unified sound characterized by a warm vibrato and large dynamic range”(Australian Clarinet and Saxophone Magazine). Since its inception, the ensemble has achieved distinction in the concert hall by presenting consistently acclaimed concerts and workshops throughout the United States and Mexico. Presidio has also enjoyed sponsorship from the American Composers Forum and appeared as guest artists at national saxophone and music educator’s conventions. Presidio is comfortable in every genre of music from classical to jazz, to backing the Temptations in a recent Tucson performance. In addition to their insightful interpretations of standard repertoire, they strive to program music by living composers and have premiered works by James DeMars, Kip Haaheim, Drew Krause, Graham Lynch, Andersen Viana and Jay Vosk, among others. To date, PSQ has released two CDs. Their self titled debut albumThe Presidio Saxophone Quartet and recent release Allegro de Concert have both received positive critical acclaim. They have also been featured on two volumes of the AUR recording label’s series America’s Millennuim Tribute to Adolphe Sax performing standard repertoire as well as two premiere recordings of Kip Haaheim’s The Clinging Fire and Judith Lang Zaimont’s Parallel Play. Presidio Quartet’s overarching goal is simple: to enjoy and perpetuate a distinctive heritage of concert saxophone performance. Lauded for their varied and entertaining programming, Presidio draws from a very unique and imaginative saxophone quartet repertoire. Invariably, a Presidio concert will include dazzling French masterworks, more adventurous contemporary American fare, and numerous fun and familiar works such as a medley from George Gershwin’s Porgy and Bess or an organ fugue by J. S. Bach. The music of this remarkable combination of soprano, alto, tenor, and baritone saxophones is sure to resonate with audiences of diverse tastes and backgrounds.